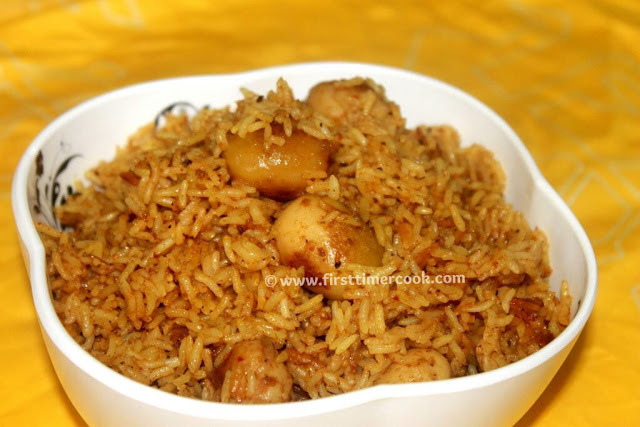 Baby potato biriyani is a different kind of biriyani and the small / baby potatoes attracts everyone. It has an unique flavor and taste. Though the biryani is medium spiced, there is no feeling of any heavyness on the stomach after having it. Its recipe is not much difficult, but have few different steps. Baby potato biryani is made with baby potatoes. Also cubes of regular potatoes can be used instead of baby potatoes. Basically a homemade spicy paste is used to prepare this biriyani. So just follow the below steps for the detailed process. Wash and soak rice for minimum 30 minutes. Pressure cook small potato for 2 whistles / boil in water until a fork inserted goes in smoothly. Peel off the skin after cool down and set aside. Grind tomato, green chilies, ginger, garlic, coriander leaves together to a smooth paste. Set aside. Heat oil in a large pan. Add boiled & peeled potatoes, toss and saute until the potatoes turn a light golden brown. Drain and set aside the potatoes. Heat a heavy bottom pan / pressure cooker. Put some oil & then add black cardamom, clove, cinnamon and cumin seed. Saute a bit & then add sliced onion and fry for a minute. Add the ground masala paste & mix well. Now add the curd and mix again, keeping the heat low. When the mixture begins to bubble, add chili powder, turmeric powder, coriander powder, cumin powder and biryani masala. Mix and cook for 3-4 mins. Add salt along with the fried potatoes and mix again well until they are coated with the masala. Cook in medium flame for 4-5 minutes until oil separates from the masala and the raw smell goes off. Now add the soaked rice drained from water. Then add 1 & 1/2 cup of water and mix well. Pressure cook for 2 whistles / 15 minutes in lowest flame. Turn off heat and wait until the pressure releases automatically. Serve hot with any type of raita. ​Prick the potatoes with fork (only once) for masala getting inside it easily. While pricking potato, be gentle and take care not to break the potatoes. Also pricking more than needed will break the potatoes while cooking. So be careful. Add oil / ghee as mentioned or little bit more as the rice will be very dry if there is less oil / ghee.